Many of the beliefs that have the greatest impact on our lives exist on a level outside of our awareness. They were developed during childhood, yet they exert a tremendous amount of control over our present feelings and behavior. Beliefs and assumptions keep us from separating facts from fears and cause us great anxiety and pain. 1. Usually you exercise at home, but some days you go on jogs with your neighbor. Every time you go, she is faster than you. You tell yourself: I’m not as healthy as she is, and, I’m embarrassed about how out of shape I am. When you compare yourself to others, you will almost always come up short. If you calmed your fears long enough to check the facts, you could tell yourself: I exercise just as often as she does, and, she is ten years younger than I am. 2. After five years of marriage, you and your partner are getting divorced. You are terrified of being alone. You tell yourself: I don’t know how to take care of myself, and, my partner is the only person who can help me. When you approach a situation like this with fearful, negative beliefs, your mind will form unproven conclusions. If you calmed your fears, you could tell yourself: I know I can function on my own––after all, I did it before I married, and, If there is something I can’t do on my own, I have friends and family who can help. We think that fear will protect us, but it doesn’t. Instead, fear makes us passive; passiveness is deadening. When you are afraid, you won’t put yourself out there and you will become dedicated to inaction. Think of your unconscious beliefs like an invisible, underlying script from which you are unknowingly acting out your life. To discover your new truth, you must mindfully explore your responses to life and see if they are fitting for the current situation or somehow rooted in the past. It’s time for some rewrites. Find quiet time and space to try this journaling exercise. Remember, your mind is in your hands, so you must put real pen to real paper. No computers! 1. Close your eyes and picture yourself as a child at about the age you were when you first developed your fear. Fully immerse yourself in the thoughts and feelings you had then. 2. With your eyes still closed, imagine a much older version of yourself, who is very wise. Let the child join the wiser self, and allow the two to sit together. 5. While you’re still in this meditative state, be mindful of your feelings. What sensations do you notice in your body? How about emotions? If there are new feelings, what do they seem to be saying? Do you notice any difference in your physical, mental, or emotional state? 6. Now, think about how you might operate in the world with this new change. How would your body posture and movement look? How might you interact differently with others? How might you face your problems or life’s challenges differently? With any form of this exercise, you will know when the words you’ve chosen are correct because you will feel a noticeable shift or release. Your feelings will lighten; your energy will increase. You won’t view the world as negatively as you did before. Since we become freer each time we process our pain, it’s necessary that you continually practice identifying and challenging your unconscious beliefs. The goal is to recognize your fear, feel it, and then calm your fear down enough that it doesn’t stop you from doing something. While Psychotherapy and journaling exercises will help you begin the process, the only way to complete this treatment for anxiety is exposure to what makes you afraid. 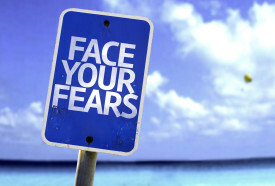 By exploring and releasing your fears––some decades old––you will open yourself to new experiences. To heal, you must uncover and process faulty beliefs––releasing them and replacing them with new beliefs that support your wellbeing.